Fare Thee Well: The Final Chapter of the Grateful Dead’s Long, Strange Trip, by Joel Selvin with Pamela Turley. There is already a small collection of books about the Grateful Dead, from bassist Phil Lesh’s memoir, Searching for the Sound, to Home Before Daylight, an insider account by longtime roadie Steve Parish. But until now, the shelves had mostly been stocked with nostalgic chronicles that go deep on the rockers’ early acid tests or their decades of electric romps through dimly-lit hockey arenas, where the cities and set-lists blurred together and the swelling crowds roared. What’s been missing is a tale about what happened once the Deadhead sticker was plastered on the Cadillac, to steal a line from Don Henley’s “Boys of Summer.” And for the Grateful Dead, that juncture of lost innocence occurred on Aug. 9, 1995, when guitarist-slash-bearded icon Jerry Garcia died. Garcia’s bandmates – Lesh, guitarist Bob Weir and drummers Mickey Hart and Bill Kreutzmann – were left stunned, wealthy and famous, with no plan for what to do once the music stopped. 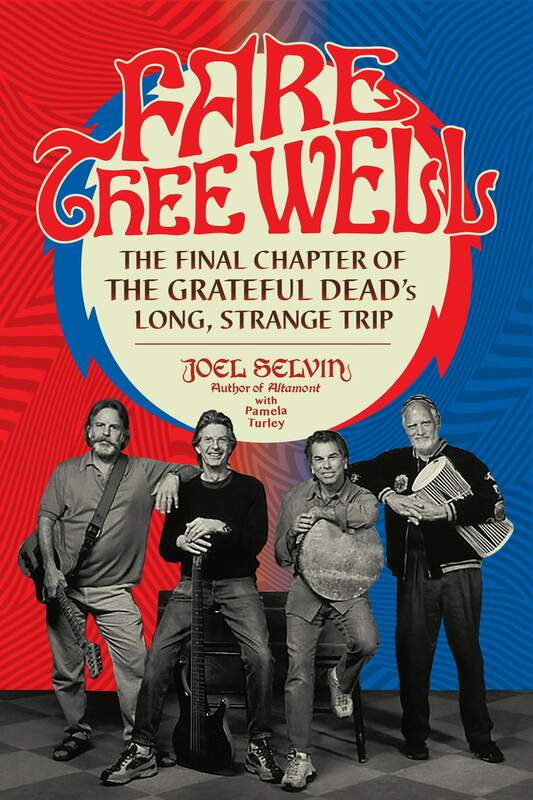 Veteran music columnist Joel Selvin’s Fare Thee Well: The Final Chapter of the Grateful Dead’s Long, Strange Trip smartly steers clear of tie-dyed ’60s mysticism, offering instead a reported look at the lives of the remaining “core four” members. It is a breezy history, not only of the many incarnations of Dead bands that popped up, but also of how the four men grappled with their own ambitions amid the insatiable desire of Dead fans to hear “St. Stephen” again. Escaping the looming shadow of Garcia – whom Selvin describes as a “father figure, the best friend” and “philosophical axis” of the band – is not easy. By 1995, Garcia had become the reluctant leader of a booming global business, employing dozens of people in its San Rafael, California, headquarters and grossing hundreds of millions on tour. The “core four” briefly discuss carrying on as rumors fly about possible Garcia stand-ins. Carlos Santana, Neil Young and others are floated. Ultimately, the band decides against it and effectively closes shop that winter with a wistful statement saying “the uniquely wonderful beast” known as the Grateful Dead is over. It was more like the beginning of a brief hibernation. Weir deals with the fallout by hitting the road with his band, RatDog, and sticks to blues tunes instead of Dead songs. Kreutzmann flees to Hawaii where he haunts beachside bars and keeps a low profile. Hart branches off and records eclectic percussion albums. Yet the siren song of the Dead keeps calling, along with baby boomer fans and younger devotees who never saw Garcia jam but want to experience the band’s sprawling catalog played on a hot summer night. Selvin, perhaps at times too dryly, observes how a certain darkness lingers in the wake of Garcia’s passing. Addiction and health issues hover, and former Dead keyboardist Vince Welnick eventually cuts his own throat. Garcia’s widows clash over money and the rights to “Tiger,” Garcia’s legendary guitar. The bouncing rhythms keep rambling on amid the bleak flashes. It’s this front – understanding the internal politics of bands and Dead World – where Selvin is most comfortable, tracing how versions of the Dead emerge year after year with names like “The Other Ones,” “Furthur” and “Phil Lesh and Friends,” depending on who’s getting along. All the while, Deadheads track each incremental change and new player on stage the same way football fans follow fantasy picks on message boards. Selvin, who had access to the camps of the “core four” but interviewed only two of them, does not take sides as the remaining musicians debate how to handle the empire. Lesh’s wife, Jill, is portrayed as the toughest negotiator in the bunch, but she never becomes a villain – just another member of the Dead family trying to figure things out. Even as the “core four” struggles with how to move forward, Selvin also reveals how the band’s spirit lives on through a new generation of artists. Phish, Dave Matthews Band and Umphrey’s McGee, to name a few, follow the model of grass roots, improvised rock ’n’ roll as a means of joyful survival in a music industry being upended by downloads and streaming. One of those musical children of the Dead, Phish guitarist Trey Anastasio, joins the “core four” for a triumphant, sold-out return to Soldier Field in 2015. Selvin shines here, capturing the side figures who make their way back to a band and a lifestyle they never really left. Of course, nothing is ever dead with the Grateful Dead. The beast carries on, this time with “Dead & Company,” a band featuring Weir, Hart, Kreutzmann and pop and blues guitarist John Mayer that has been filling amphitheaters across the country in recent months. Lesh, 78, is back home in northern California, tending to a restaurant and music venue called Terrapin Crossroads that draws thousands of pilgrims. Filling the gap left by Garcia has been both an impossible task and a redeeming journey. The musicians could not replace the enormity of his presence but they have been lifted by the many shows and bands that have emerged since 1995 – and by the way, the Deadheads have never stopped dancing.